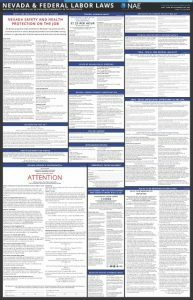 The all-in-one poster (pictured left) contains all required federal and Nevada labor law notices, including the new Nevada Pregnant Workers’ Fairness Act and Leave for Domestic Violence notices, in one convenient 25″ x 39″ laminated poster. All NAE member organizations receive one complimentary all-in-one poster with membership. The complimentary poster includes updates, as needed, at no additional charge. Additional posters can be purchased through our website. NAE members will still be able to download the latest federal and state labor law posters individually from Members Content. Your member ID is required to access the posters for download. All NAE member organizations can take advantage of our Poster Update Service for any all-in-one posters purchased from NAE. The Poster Update Service is available to NAE member organizations for as long as membership is active and in good standing and the annual per poster subscription fee is paid*. Make compliance EASY — order the Poster Update Service today! *Poster Update Service is included at no cost for the complimentary poster. *All pricing is per poster. Complete this form to order our all-in-one labor laws poster. If you have questions about completing this form, please contact NAE at (775) 329-4241. IS COMPANY A MEMBER OF NAE? WOULD YOU LIKE THE POSTER UPDATE SERVICE?